This book is an undergraduate level textbook. It is an expanded version of the first edition. The prerequisites for this text are first year calculus and physics, and a two-semester course in circuit analysis including the fundamental theorems and the Laplace transformation. This text begins with is an introduction to the nature of small signals used in electronic devices, amplifiers, definitions of decibels, bandwidth, poles and zeros, stability, transfer functions, and Bode plots. It continues with an introduction to solid state electronics, diodes, bipolar junction transistors, field effect transistors (FETs), unijunction transistors, diacs, triacs, silicon control rectifiers (SCRs), and other PNPN devices. The highlight of this text is a long and detailed chapter on op amps. Integrated devices used in logic circuits, and their internal construction are discussed in another long chapter. It concludes with a discussion on tuned amplifier circuits and oscillators. It contains several examples with MATLAB computations and Simulink models. 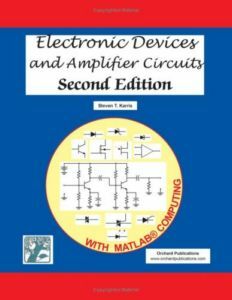 Includes an appendix on Proportional, Integral, and Derivative (PID) circuits A supplementary text to this title is our Digital Circuit Analysis & Design with Simulink Modeling and Introduction to CPLDs and FPGAs, ISBN 978-1-934404-06-5.